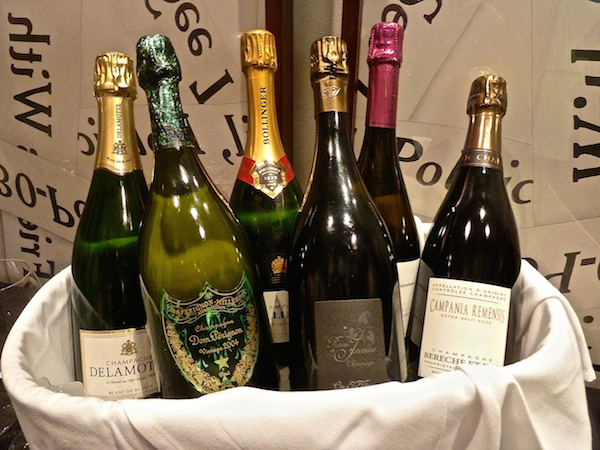 Those of us who feel champagne is right for any occasion have an advocate in Antonio Galloni. The well respected wine critic recently led a champagne tasting at CORE: club during which he guided us through an evening entitled, “A Wine for all Seasons,” expressing his view on the versatility of this festive wine, often underestimated as an accompaniment for a wide variety of food. Any who have followed Robert Parker’s The Wine Advocate in the last decade or so have read reviews by Galloni, who was, until last year, the publication’s lead critic. In February of 2013, he left to bring his vision of a “modern-day wine media platform” to life. Bringing the wine to the people, Vinous is a consumer-oriented, experiential-focused site with opportunity for reader interaction and discussion. Engaging the reader with ongoing reviews, articles and videos, it is a new accessible approach to wine journalism. I felt an immediate kinship with his core values and passion for reporting the stories behind the wine while maintaining editorial independence with no commercial ties. He doesn’t merely taste the wines he reviews, but spends at least six months a year on the road, visiting the wineries he covers so that he can provide an in- depth experience of each wine and region. Through his narrative reviews, you get a fuller picture, much more than any mere score could impart. It is this mission of passion and education that has made Vinous one of the fasting growing wine content websites in the world. Experience, inspire, inform – sounds familiar! Our evening involved tasting six different champagnes Antonio had chosen, three from large producers and three growers’ champagnes. 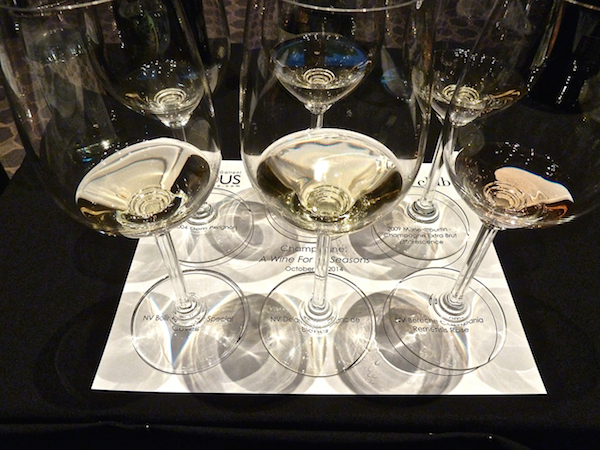 Before we look at what I tasted and learned about these wines, let me share Antonio’s views on glassware. He feels strongly that champagne should be served in a white wine glass. A flute, he explains, although aesthetically beautiful and conducive to producing nice perlage (bubbles), tends to hide flaws in wine with its narrow constrictive nature. The larger glass enhances a fine champagne’s quality yet will also reveal the unsuccessful aspects of lesser wines. There is a reason there is no such thing as inexpensive champagne. It is a long, complicated process that Antonio explained but you can also review here. But our first champagne was the very reasonable NV Delamotte Blanc de Blanc (for beginners – a blanc de blanc is a wine made from chardonnay). 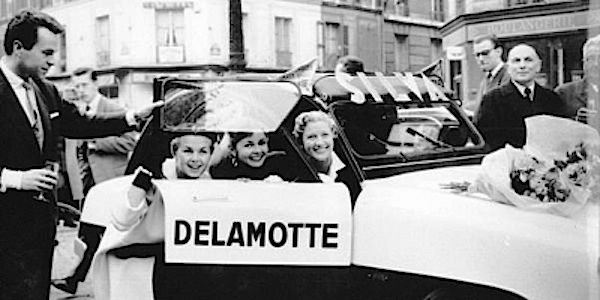 The historic house of Delamotte‘s top wine, the prestigious Salon, is only made in years the firm feels warrant it, so in these other years, the grapes go to sister house Delamotte. This non vintage champagne offers a classic blanc de blanc experience, fresh and clean with flavors Antonio described as white flowers, jasmine, citrus and lemon peel. When tasting champagne, it is important to relate it to a full sensory experience. 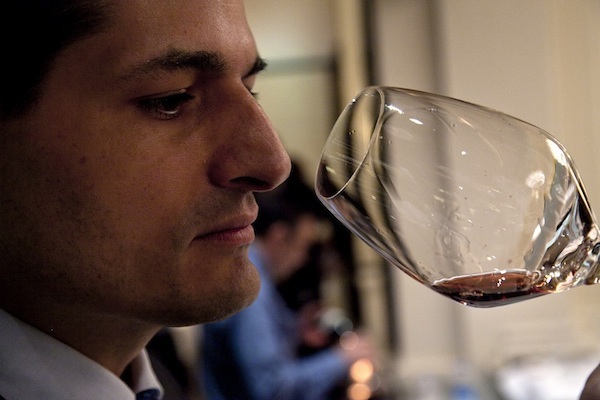 As Antonio explained, you don’t really taste that much in wine except the basic sensations, what you really do is smell. And as we know, smell is the one sense most linked to memory and experience, which is very personal. So it is often a good exercise to discuss texture, a more universal sense, to imagine what a wine might feel like. And our next champagne, the NV Bollinger Brut Special Cuvée (maison below) had a very different touch, a fuller, smoother density like a great cashmere, which can be accounted for by the added presence of pinot noir with the chardonnay. I am a personal fan of this richer, fuller, rounder flavor and even with this, Bollinger’s entry level champagne, you can taste the different approach. Our final “big house” champagne was a special treat. 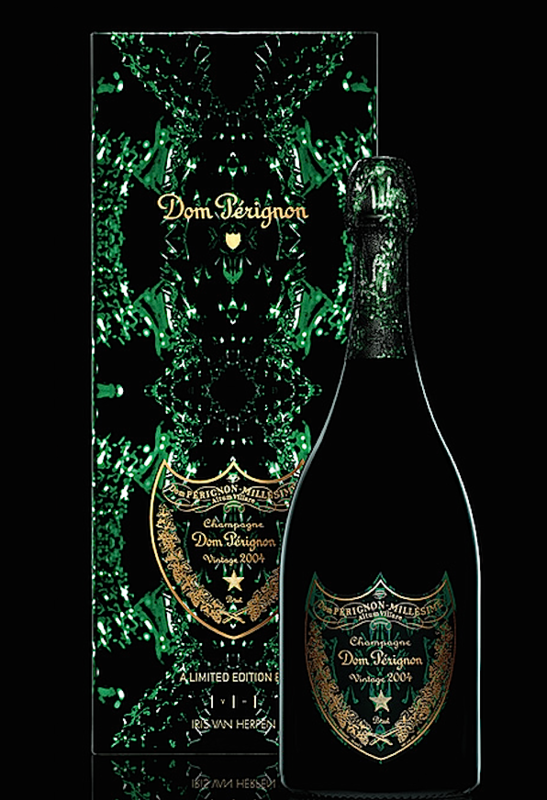 The vintage 2004 Dom Pérignon (the edition with artist label by Iris van Herpen as seen below) is just coming into its own, “rich, ample and beautifully nuanced,” according to Antonio’s review. Dom Pérignon is a champagne made in steel and Antonio described this vintage bottle as classic DP, a wine of timeless beauty, with a mineral driven nose of slate, gunpowder, or rocks after the rain. And yet it also has a delicacy, changing flavors in the glass. A true classic. Dominique Moreau, below, is the proprietor of Marie Courtin, an understated rustic vineyard that seems more like a humble farm that grows grapes. And yet she produces champagne that is equally at home in the most elegant NYC restaurant as it is in the French countryside of the Aube. We tried her 2009 Marie Courtin Champagne Efflorescence Extra Brut of 100% pinot noir. Again with no dosage, this wine exhibited a depth and strength representing the pure richness and intensity of the grapes alone. Our last grower champagne was hands down my favorite. 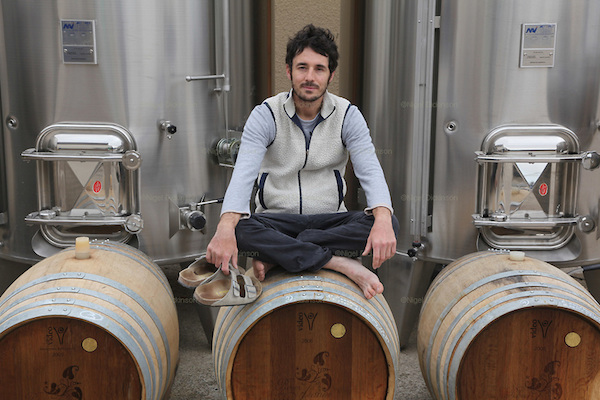 The NV Bereche Campania Remensis Rosé is from a family vineyard, run by brothers Raphael and Vincent Bereche, below, at the heart of the renaissance of grower champagnes. This very balanced and delicious wine is so full and substantial that Antonio suggests you could even serve it with meat or tuna. While I didn’t necessarily notice the “pomegranate, orange peel, spices, chalk and freshly cut flowers” that Antonio mentioned in his notes, I can tell you that this was exceptional, truly exhibiting, as I learned with Antonio that evening, what the growers’ champagne experience is all about. Wine is very personal and Antonio recommends developing a relationship with a favorite merchant who can help you not only learn but give you access to difficult-to-find wines such as these. While we often celebrate the information and even merchandise available to us online, there is still nothing that can replace such real life relationships. But the next best thing in the world of wine is a vicarious visit to Vinous. If you are a wine and/or champagne lover who appreciates more than just a score, I encourage you to check out the site where Antonio and his team believe, as I do here, that it’s all about the story. His passion for wine, intelligent yet personable style and extensive knowledge make Vinous a vast and valuable resource. But fellow wine fans be forewarned, I have now fallen down the rabbit hole on more than one occasion. You may preview the site, which gives a healthy look at the site’s offering , but for access to the full archive of articles, videos and more, there are subscriptions at classic and premium levels – the perfect gift for those budding or experienced wine lovers on your list. It has been my pleasure to introduce you to Antonio and Vinous and I hope to have the opportunity to bring you more from them soon. This entry posted in food and drink, wine. Entry Tags: Antonio Galloni, champagne, Vinous, Wine, wine tasting Bookmark the permalink. What a wonderful site and a fantastic piece, Stacey. I definitely will be on the hunt for the smaller vineyards (but as you know they can be hard to get here in France unless you actually go)…merci! Stacey, I love that you learned so much from the growers about their champagnes and vineyards! 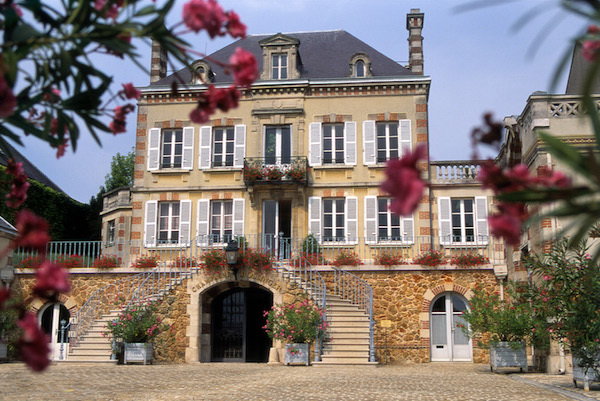 It sounds like such a wonderful experience filled with delicious champagne!